Welcome to 2018, and another exciting year in Greater Hartford real estate. The new year began with a similar level of activity as observed during the past two years. 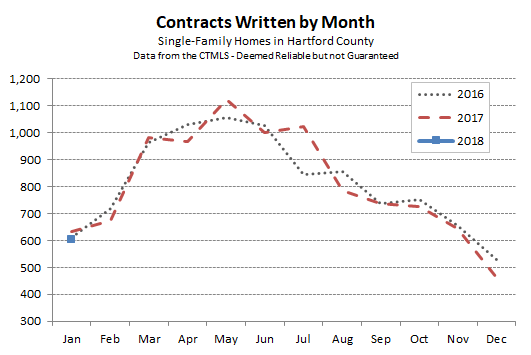 There were 602 single-family contracts during January in Hartford County. This total was about 5% less than last year, but well ahead of the January totals for years prior to 2016. The statistic that jumps out in this report is the inventory metric showing how few homes are available in the region. Inventory levels of less than 3 months are typically considered sellers’ markets. 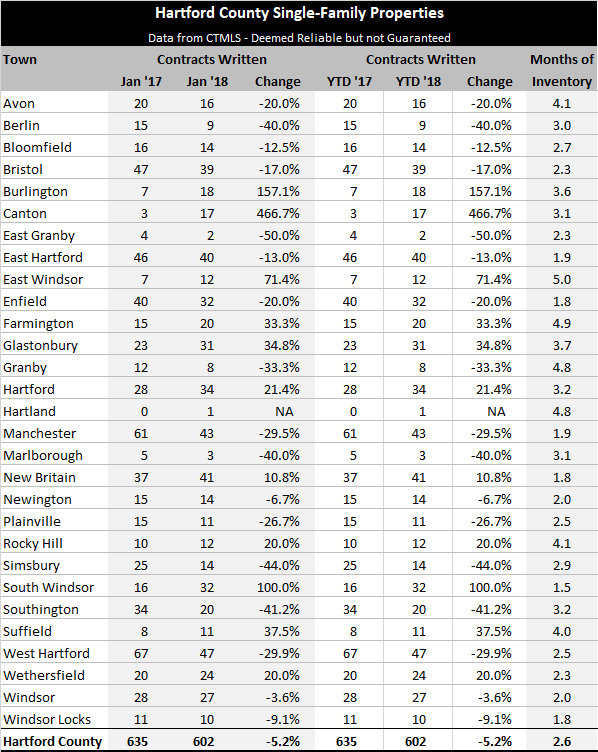 Hartford County is currently at 2.6 months. That said, the current total of available homes is seasonally depressed. More and more homes will come onto the market in the coming months as spring approaches. Eight towns have 2.0 months, or less, of homes available. This will keep the deal total from climbing too high – buyers don’t have much to choose from. As a point of comparison, last year at this time there was 3.0 months of inventory available. Perhaps this explains why January 2018 trailed January 2017 slightly. We’re expecting 2018 to be another strong year for the real estate market, and nothing that happened in January changed our minds. Reach out to either of us at any point for more information, or to get started with your transaction. We’re happy to help in any way we can.